The award winning CACI (Computer Aided Cosmetology Instrument) has gained the reputation as the finest micro current machine available. Backed by over twenty years of medical research, the principle of the treatment is muscle re-education, lifting and toning the face or body contours, reminding the muscles of how they used to be. 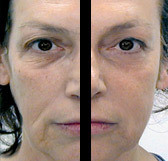 Treatment results are often so dramatic that CACI has become known as “The non-surgical face lift”. The treatment also affects the skin tissues, clients will find lines softened and skin tissue refined. The CACI treatment is completely safe and totally painless. The skin takes on a wonderful glow and has a firmer more supple appearance. The treatment is as much preventative as corrective and is therefore suitable for all ages. A Course of 10 is recommended initially, followed by a maintenance treatment every 4-6 weeks. Following a course of treatments, wrinkles are dramatically reduced, fine lines smoothed and softened, puffy eye bags visibly diminished. This treatment has twenty years of medical research behind it and works by re-educating, toning and firming the facial muscles. Improving skin elasticity and reducing the appearance of fine lines and wrinkles. This treatment will work to lift and firm the muscles around the eye area, smooth the appearance of fine lines and wrinkles. The new CACI Quad probes have been designed to specifically target loose sagging muscle around the jaw line. Lifting and firming facial contours. Ultrasonic vibrations gently exfoliate and deep cleanse the skin, and then LED photo stimulation is used to soften lines and wrinkles. Leaving your skin smoother, brighter and thoroughly hydrated. LED red and blue light therapy is used for their anti-bacterial, anti-inflammatory and wound healing properties. A smoothing and calming hydro mask is then applied reducing redness and irritation. A course of treatments will calm inflamed skin and stimulate tissue regeneration and healing. The appearance of acne and skin blemishes is visibly reduced.